“Undiscovered Dinosaur Skeleton” was the name given to this 40-foot long sculpture created by senior sociology major Blaise Freeman during an advanced studio art class last spring. 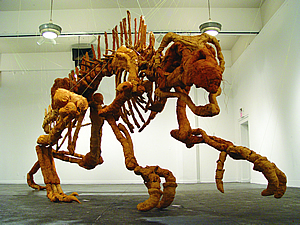 Measuring 15 feet tall and constructed with newspaper, wire, burlap, and clay, the fictional dinosaur was on view at the Allen Art Building this semester, where it hung suspended from the ceiling with fishing wire. Freeman, who has a minor in art, studied paleontology, functional anatomy, and abstraction before beginning the six-month assembly process.